Tonight, we had some friends over for dinner. I made this classic NY cheesecake to go with coffee after dinner. There’s nothing better than dining al fresco in the backyard, and topping it off with the 4 C’s: coffee, citronella candles, conversation, and cheesecake. This is my favorite cheesecake recipe. 1.Unwrap the packages of cream cheese and let them sit on the counter. Place the (un-cracked) eggs in a bowl on the counter to bring them to room temperature too. 3.Assemble your 10-inch springform pan so the bottom of the pan is upside-down. 1.Combine the graham cracker crumbs and sugar in a big bowl. 2.Pour the melted butter over the crumbs.Mix with your fingers or a fork until crumbs stick together. 3.Once the cheesecake crust is mixed up, put it into your springform pan. Press it into the bottom of the pan so it forms a hard base. Keep pressing the crumbs along the sides, about half way up the pan. 4.Bake the crust for 8-10 minutes in the oven (at 350°). Transfer to a rack to cool. 1.Put the room-temperature cream cheese in the mixer and beat till creamy. 2.Add the sugar, lemon zest, lemon juice, vanilla extract, and salt. Beat until smooth. Now is the time to taste it. If you love lemon, add a little more. If you want it sweeter, add a sprinkle of sugar. Just add a little at a time and always taste it. 3.Add the flour and beat it in. 4.Crack the eggs into a bowl. Gently add one egg at a time to the cheesecake filling. Beat each egg until just blended. Stop the mixer to scrape down the sides of the bowl between each egg. 5.Pour the filling into the crust. It should not be filled higher than 3/4 up the sides of the pan. If you have a little extra batter, read on for ways to use it. 6.Bake the cheesecake about 60 minutes. Let it cool for 10 minutes before adding the topping. You’ll know it’s done when the outer 2 inches is puffed and slightly browned. The center will still look slightly wobbly, like jell-o. It’s okay if you see cracks in the cheesecake. The topping will cover them. 1.While the cheesecake is baking, mix the sour cream, sugar, and vanilla extract in a bowl. 2.After the cheesecake has cooled for 10 minutes, drop spoonfuls of the sour cream topping over the cake. Spread it over the entire cake with the back of the spoon. 3.Bake the cheesecake for another 7 minutes, until the topping is set. 5.Run a knife around the edges of the cheesecake and then let it cool on a rack before putting it in the refrigerator. 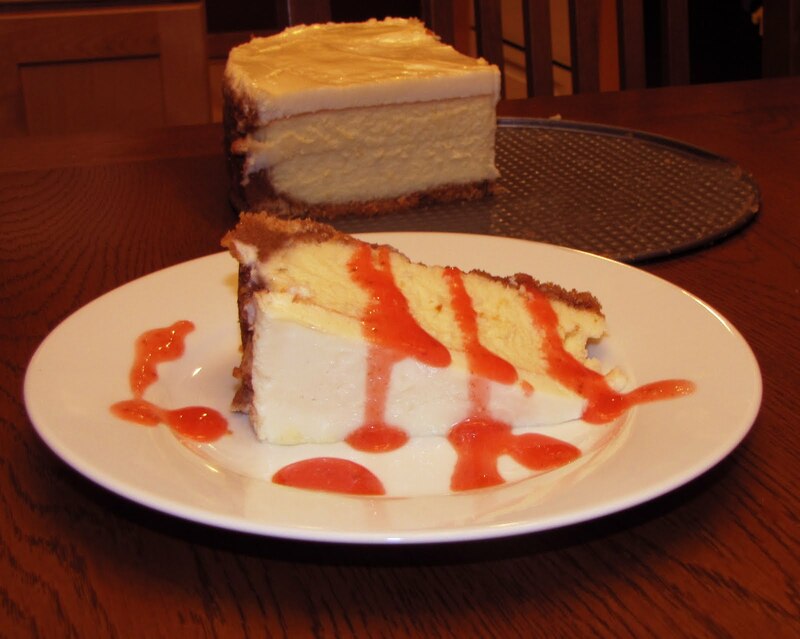 6.The cheesecake can be made 2-3 days ahead, but the flavor is best 1 day after baking it. To keep it from getting bumped into, keep it in the spring form pan until you’re ready to serve your cheesecake. When you wrap it with plastic, don’t let it touch the top or it will smudge it. Did a strawberry puree out of strawberries that I froze earlier this summer, some sugar and some lemon juice to drizzle over the top. This is also amazing with raspberry puree, or chocolate or caramel sauce.